Beans fall into several categories--bush, pole and shell beans. Bush beans are eaten fresh and grow on compact, bushy plants. They produce beans early--about eight weeks after planting--but halt production within a few weeks. Pole beans are eaten fresh as well, but grow on sprawling vines that require support. They produce two to three times the amount of beans produced by bush beans, advises Cornell University, and may taste better as well. Pole beans are slow growing. They start producing beans about 11 weeks after planting, but they continue producing until frost, according to Barbara Damrosch, landscape designer and author of "The Garden Primer." The more they're picked, the more they produce. In fact, most gardeners tire of this chore long before frost comes, but for gardeners interested in canning or freezing for winter use, pole beans are the way to go. Shell beans may grow either on vines or in bush form, but are used for the bean inside the shell, which is eaten fresh or dried. Pole beans don't tolerate cold temperatures and must be planted after soil temperatures are consistently above 60 degrees F, according to Cornell University. Planting them sooner will result in sparse germination or seed rooting. The plants emerge quickly when planted in full sun. The plants begin flowering midsummer and produce beans by late summer. Pick beans when they are about as thick as a pencil. Thick beans with lumpy pods will have white, dried out centers and a woody taste. Beans are harvested by pinching them carefully off the stems. The vines produce a tangle of beans and leaves, so beans are easily hidden underneath foliage, especially toward the bottom of the plant. 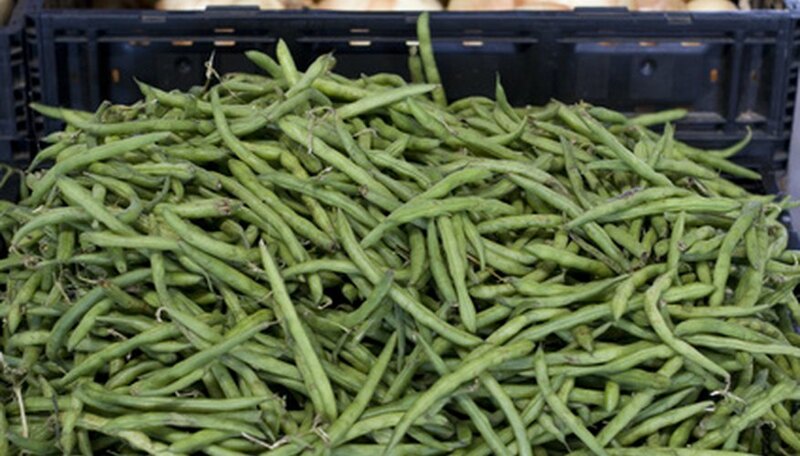 Beans are best eaten soon after picking or processed through freezing or canning. Bean plants have fuzzy, fibrous leaves that cause itching and skin irritation. Wearing a long-sleeved shirt and pants is advisable. Pole beans need a good sturdy support to grow on. For a small crop, 8-foot-long saplings or pieces of lumber can be placed in the ground for each plant to crawl on. Larger crops can be supported by making a frame the length of the row and stringing wires vertically between the frame. Since pole beans are prolific producers, gardeners should assess the time they have available to keep up with bean production, as well as how much produce their family will consume. Kentucky Wonder is an old-time favorite with good flavor and disease resistance. Scarlet Runner has red flowers, while Romano is an Italian flat-podded pole bean. Hundreds of varieties exist--some producing yellow, purple or speckled beans. How Tall Does a Bean Plant Grow?